I am forever tied to the Twin Cities by virtue of my birth in Saint Paul and my undying love for the Minnesota Twins (the article on the ideal feminine incarnation of the Twins is forthcoming). However, up until a few weeks ago, Minneapolis and Saint Paul were cities with which I was unacquainted. Outside of their sports teams and Prince, I knew all of three things: they are a mandatory stop on any music tour, they’re home to a burgeoning hip hop scene, and they’re no less than two hours south of my matrilineal family. The last weekend in October 2012 brought me into a new understanding of Minnesota culture as I joined hundreds of other pilgrims to the Minneapolis suburb of Brooklyn Center, home of Surly Brewing, for Darkness Day. Perturbed, irascible, irritable. Uh, angry. A Midwest microbrewery known for christening its beers with synonyms for the ill-tempered (Furious, Bender, Hell, CynicAle, Abrasive). The absence of light. Ooooh, how original. The Russian Imperial Stout released in limited quantities once a year by Surly. Each year’s artwork is unique yet in tune with the Halloween season—2012 features a werewolf. Darkness Day. 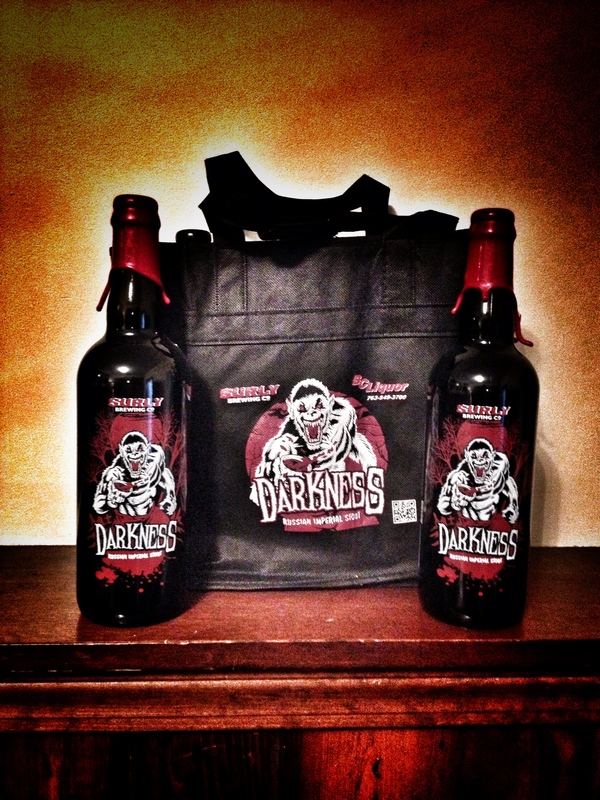 Chicagoans may know of Dark Lord Day, sponsored by Three Floyd’s Dark Lord Imperial Stout. People outside of Chicago or the craft beer scene probably know of Black Friday. Or Apple’s release of the iPhone X. Or Occupy. To the passerby it all looks the same: mass youth populace, often bearded, milling around outside for apparently no good reason. People start lining up at 3:30 the day before to get the wristbands which guarantee the wearer the right, not to enter as it is an open event, but to purchase up to six bottles of Darkness. This year there were 1500 wristbands made available the morning of the event. But there is a reason, and it gets to more than a single beer. It is more than the exclusivity of a limited release. At its most generous it is a testament to human camaraderie; at its most derisive it is modest carnival. Communicants have come from as far as Maine, if not further, bringing their regional brewery offerings with the expectation that others will reciprocate. Surly even brings out a couple of one-off kegs to share with the faithful, along with their standards on tap. Realistically, it is a mass beer tasting. That, as much as Darkness, brought my friends (E, N, and T) and me to the Twin Cities; the opportunity to partake in the festival. But Surly could not survive as a regional company without a local consumer base, and we wanted to experience that as well. Upon entry into Minneapolis, our first pit stop was the local liquor store, Blue Max. Their name says a lot; they squeeze the max out of their limited floor space. The back two coolers were home to the mandatory Miller, Coors, and Bud, but that was it. Five times as much fridge space was devoted to domestic microbrew packs, plus two more fridges for bombers, and three more fridges for imported micro brews. Outside of the fridges were more packs and bombers. The sign on the door sums it up: “Over 1000 Different Beers”. Besides beer, Blue Max also offered excellent wine and liquor selection. Some of the rarest whiskies I’ve ever encountered I saw there, for which I wish I had the budget. Blue Max cares about those who care about what they are drinking. After purchasing a Deschutes’ Obsidian Stout sixer, we proceeded to the Town Hall Brew Pub in downtown Minneapolis where we met E’s family in the dining room, past the bar and fermentation tanks. We had perused the website ahead of time, so we thought we had a good idea of what we wanted. A quick look at the menu told us we were wrong – there was a lot more than we had anticipated. I opted for the seasonal flight: a malty, toned down 15th Anniversary IPA that landed right in my IPA wheel house; a coffee porter that tasted as though it was mostly coffee; an underwhelming Scotch ale; a syrup-saturated cranberry ale, easily substituted as a cocktail; and a flawless pumpkin ale with strong fall flavors and a solid body. I sampled the table’s fried pickles. Stuffed with cream cheese and served with amped up blue cheese, they far surpassed my previous experiences with the appetizer. I avoided the near calamity of the Santa Fe veggie burger by choosing the medium Seven Corners bacon barbeque burger. Mind safely unblown but solidly not a veggie burger. To slake the thirst my burger abandoned me with, I was torn between the H2o Oatmeal stout and the Eye of the Storm Honey Ale. Only my normal affinity for stouts gave the former the slightest chance – the latter’s name was just too tantalizing. My choice was rewarded with a very smooth finish touched with honey’s sweetness, all the while hinting at the 10% abv. Spend the night with the 900 plus in sub-freezing weather, foregoing any real sleep for the guaranteed bottles and beer community. Best case scenario, we get wristbands to go with our frostbite; worst case, we just get frostbite. Sleep in the luxury of E’s parent’s home, enjoy a shower and breakfast, and appear at Surly about an hour before the gates open. Best case scenario, we still get wristbands and don’t get frost bite; worst case, we don’t get either. After minimal deliberation, we opted for number two, writing off our pipe dream of getting wristbands. We arrived at 10 am to a warm reception, “You here for wristbands? Turn left.” Surly had this down to a science. One volunteer checked the front IDs, the other checked the back seat and wristbands were promptly distributed. We quickly asked how many people had camped out. The volunteer didn’t know for sure, but it wasn’t enough to warrant our fear of not getting bands. Way to go Twitter. Thanks to your number lies, we got a full night’s sleep. I’ve never been so thankful I was lied to. We parked and surveyed the huddled groups of people pocketed along the street leading to Surly’s gates; we had an hour to kill before we could enter and starting drink the $4 taps of Surly standards, variations, and Darkness. The hordes had apparently dispersed after they received their wristbands, retreating to warmth of homes until their specified purchasing time, but there was still plenty of community to be found. We walked about fifty yards before stumbling across a keg and two Surly staffers surrounded by a crowd. The offering? A one-off of the popular brown ale Bender, brewed with cocoa nibs. Not only was it heavenly, it was free. A short, wide-hipped brunette with glasses and a wool beanie pulled over her head. The volume dial on her vocals was matched only by the shiny purple spandex pants she was wearing. She was so tight by the time we arrived that she had fallen and broken her hand, but not realizing the severity, opted to stay at Darkness rather than visit a doctor. The doctor will be there in the morning, Darkness Day wouldn’t be. Back Fat. A boisterous, inslopsicated redhead in an Indianapolis Colts hoodie, Back Fat had planted himself 100 yards from Surly’s gates and was the mastermind behind a sizeable beer collective. “Yo, you guys want to try some Dark Lord 2012. Contribute to the table” – he gestured to the adjacent table – “and help yourself.”“Thanks man, but we don’t have anything to contribute.”“Oh, that’s cool. Just help yourself anyways.” So we sampled his wares and were pleased. When we came by later, the operation of Back Fat’s empire had been taken over by a large, older man; probably risen from a previous role as Back Fat’s muscle, he was a bit stricter on the bartering standards. The original mastermind was no longer in his right mind, and merely mingled nearby. The odd couple. Standing at Back Fat’s table were short woman – probably in her 60’s based on her style and hair color – in rapid conversation with a short, trim Asian, who was three sheets to the wind. We caught snippets of her comments about what she had and hadn’t heard of and suppressed our chuckles at her foil’s facial responses. A gentleman wandering about the street, donned with a Bass Pro Fishing Shop cap and a mini-keg resting in the crook of his arm. He was generously offering to all passerbys but we were still savoring our Cocoa Bender and were forced to pass. Damien: a great dark ale brewed from Darkness excesses. The Brettliquor IPA: This IPA was good – very good in fact – but I was expected a larger liquor taste based on the name. Cask Tea Bagged Furious: The flavorful variation on the Surly standard was hampered by the carbonation lost to the cask aging process. We were in the last group to purchase bottles and, having exhausted ourselves, embarked on the return journey to E’s. Knowing we were to leave early the next morning, we felt that we had one more stop to make: a return to Blue Max. Our plunder included an array from Utah’s Epic Brewing, Colorado’s Odell’s Myrcenary and IPA, and Kansas brewery Tallgrass’ 8-Bit Pale Ale. Outside of our Surly purchases, we didn’t buy any native Minnesota brews, but by the mercies of Blue Max, we were about to bring home western craft beers not distributed to Chicago. Gathered around E’s kitchen table after dinner, we prepared to sample our plunder. But the degustation we had anticipated before the weekend did not happen that evening. T found a La Z Boy and was out like Quintin Berry. E’s consciousness ebbed on the couch and his dad drifted upstairs. N and I sat at the table watching the game to the end, unwilling and hardly able to move. Darkness Day had won. We had spent six hours wandering the parking lot and interior of a regional brewery, sampling their wares, bumping in and out of conversation with strangers, and shouting ourselves hoarse over the music and mayhem. Minnesota, and Surly in particular, had filled out goblets and we drained them.